In Today's world revolves around high technology & most companies have invested substantially in automated plants. For this reason most manufacturing companies are looking for competent engineers with basic aptitude towards automation and ability to work on varied brands of PLCs, Drives, MMI and SCADA. The usage of automation has increased more than tenfold in each industry for them to compete globally & the requirement for PLC, SCADA, MMI/HMI, DCS, trained engineers keep on increasing. 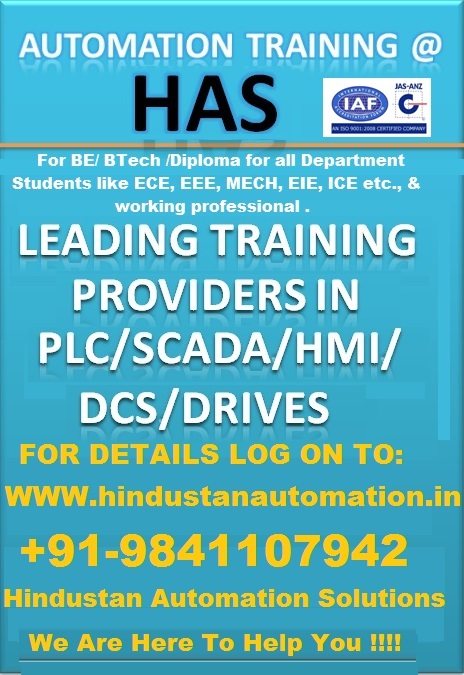 We have been conducting training on various industrial automation tools such as PLC,SCADA,MMI/HMI,DCS for college students , fresher’s and industry professionals every month. We also provide tailor made training for specific areas of technology. 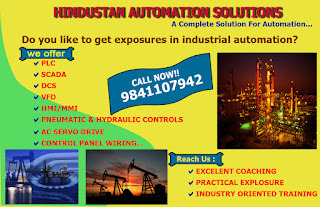 http://www.hindustanautomation.in/index.phpIn Today's world revolves around high technology & most companies have invested substantially in automated plants. For this reason most manufacturing companies are looking for competent engineers with basic aptitude towards automation and ability to work on varied brands of PLCs, Drives, MMI and SCADA. The usage of automation has increased more than tenfold in each industry for them to compete globally & the requirement for PLC, SCADA, MMI/HMI, DCS, trained engineers keep on increasing. 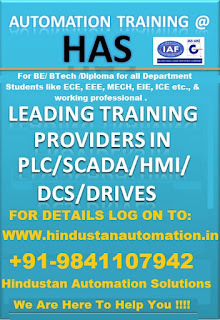 We have been conducting training on various industrial automation tools such as PLC,SCADA,MMI/HMI,DCS for college students , fresher’s and industry professionals every month. We also provide tailor made training for specific areas of technology.